Home Accessories Why wearables will disappear – or will they ? Why wearables will disappear – or will they ? The flood of wearable technology in the past few years has a large extent been a battle for the real estate of consumer wrists and more recently the ear. But this has distorted the bigger potential. Forget the debate as to whether the smart watches are here to stay or a passing fashion. There have been far more significant wearable technologies, quietly getting on with changing the world over the last decade, receiving far less fanfare. So what are these quiet disruptors? Much of this has been in areas like healthcare where the ability to monitor and manage critical health issues using small worn devices have been quietly continuing to grow. This is liberating health services to be possible on the go, relieving pressure on hospitals and giving more and more patients the benefit of treatments in the comfort of their homes and a return to active lives. The Keeogo is a great example of this, providing augmented strength to enhance active lifestyle of people with mobility issues on a much larger scale than most wearables. In the entertainment industry it has also made amusement parks cash free, and smart. Disney developed their MagicBand as the one stop ticket around their amusement parks, becoming an easy payment system removing the need for wallets and tickets, while providing then the ever valuable user data. In the automotive world, electronic entry has become the standard don’t even think of this as a form of wearable technology making life simpler, yet the majority of us still use a mechanical lock and key for our front door. What is interesting is how far we can trust wearable technology… just not with our homes. These types of example often go unnoticed. So while there will always be some people that are interested to know themselves better through hard stats and data from fitness trackers monitoring their everyday lives, this has not translated to the masses. Many often seem like technology looking for a solution. The parody ‘beat tweeter’ merges wearable with social media – a ring that will post your final social media message to the world when it monitors your demise. While this deliberately mocks the bad ideas in the category it also highlights the errors of looking for uses of the technology rather than starting with genuine user needs. On the serious side there have been lessons learnt. Nike and Google both entered with great fanfare, only to exit very publicly, both suffering difficulties faced by non-hardware focussed businesses entering a consumer hardware market. Many products in the current generation of devices have been battling with the same issues of technical constraints, trying to make smaller and smaller devices but with longer and longer wearing times. The focus is on data gathering rather than making sense of the data and turning this into action. Wanting larger and larger screens, and the battle to provide some kind of meaningful user interaction with a device that is dependent on a smartphone. So it’s no wonder that all the hype peaked around a year ago. But what are the lessons can we learn to better approach the next generation of wearable technology? Generic ‘recreation’ wearables have been dominant, aiming to find that big mass market appeal, epitomised by the very late arrival of Apple to the party. Unfortunately ‘recreational’ interest is as far as that need goes, attracting the experimenters and early adopters. In contrast, no one can question the benefits of the wearable heart monitor for high risk patients, as being developed by Philips, which connects the system direct to their doctor. The more clear the user need the better the value it will provide and reason to stay. It is the specific, not generic applications that are best fulfilling their market needs, from Disney’s MagicBand to heart monitors; each is designed around their specific needs and function. Having one size fits all may work in smartphones, but in wearables this is only driving compromises. Not all applications need a screen, some want long battery life. Should it be wrist based or worn entirely differently? Too much compromise is required with current technologies to cover all in one. While in the future they may merge, it’s too soon to say yet. While there will continue to be a desire for new consumer facing wearables, it seems that a saturation level has been reached. While that ‘killer benefit’ is still being searched for, far too much emphasis is placed on making glamorous, premium watch and jewellery like devices. These are purely exercises in aesthetic design, seemingly trying cover over the challenge around unclear purpose. Rejecting this consumer fashion approach and thinking about everyday applications in the workplace, industry, healthcare or education presents more purposeful applications. What business wouldn’t want to improve staff safety, performance, or even happiness? It’s only then that wearables can be designed with purpose and context in mind. Too many wearable devices demand continuous or long term use, which bring significant challenges to power and usability. However, taking the opposite focus and thinking short term can liberate. where there is simplicity to purpose and use, and doing that job well for a short period. L’Oreals UV detection plaster is a great example of this, a short use with a clear and focussed benefit. Similarly at Kinneir Dufort we helped develop Ambicare, a short term wearable light therapy device for skin cancer treatment in the patient’s own home. Much of the current business models have focussed on the traditional hardware selling model. However, this drives maximum value from high end purchase prices, hence the trend toward premium smartwatches. To open up the potential we need to instead think about the product at a service. How can it be the critical link to being part of future services? We need to break the objectification of wearables on wrists and even the latest spotlight on hearables. 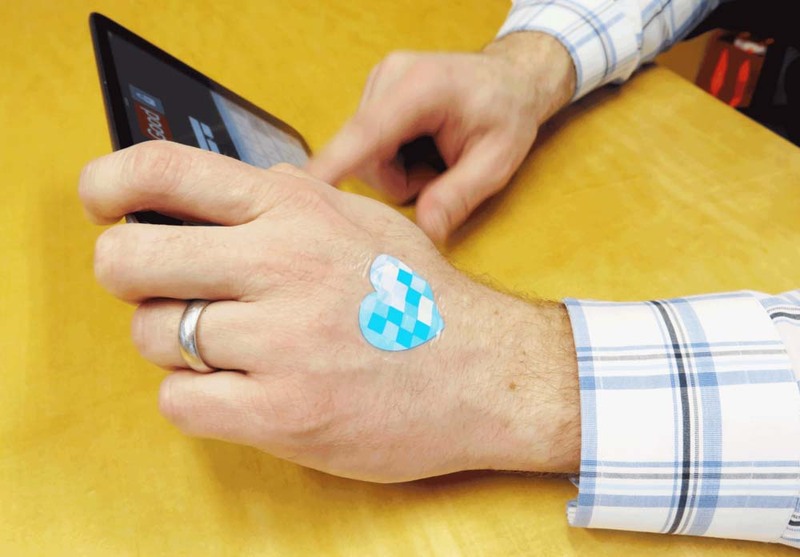 Using wearables as enablers of a service provides rich and fruitful ground. Just look at insurance companies, where they offer lower premiums for those whose fitness trackers show they are regularly active. delivery didn’t need an address it would be delivered wherever you were on that day, thanks to a smart location system. As we see in the software world, staying experimental for longer, rather than issuing final products has many advantages. Engaging users early, lets them shape and inform, staying in the creative loop of ideas, continuously making and learning. Building working prototypes and experimenting with user centric thinking will develop better solutions that closed development approaches. While Google glass was in essence a beta launched ‘explorer edition’, in many ways it was too fully formed and appeared much more as a final product. Many of the early wearables work essentially in isolation between the device, user and smartphone. Looking from a system approach creates greater potential, placing wearables as just an element of the bigger IoT world. The opportunity is to think about the role they can play, connecting the user to spaces, services and other smart products. Taking this bigger view turns them into an enabler not the end goal. The more collaborative approach taken by Nest, where they work with various smartwatches, is a great example. Much of the success of future wearables will come down to the ability to reflect on what has happened in the last 5 year and respond with radical new big ideas rather than continue on the same path. The future will require a total rethink in attitude, application and appearance. Breaking one or more of the rules that have defined the category to date with be crucial to success. Focussing on genuine need, as often best demonstrated in the medical industry. Targeting specific applications and not trying to be a ‘swiss-army’ style wearable. Thinking short term uses with high value data, in essence the wearable could become a commodity consumable much like one a day contact lens. It’s time to reject the fashion led thinking and experiment more to prove value in new spaces and applications in professional contexts. In many ways we’ve been looking at it all wrong. The future is to make wearables seamless and invisible in the everyday, quite the opposite of the fashion led status objects. These devices will be simple, like smart keys, insoles, packaging, clothing, implants and plasters embedded and hidden in the fabric of everyday. Looking on the surface, they will disappear from sight. Beneath the surface they will fulfil specific needs working in connected systems making life more efficient, safer, more automated and more personal. Wearables are most definitely the future, they just need to disappear. Peter has worked in front end innovation for last 15 years developing big ideas that are inspired by new insights yet grounded within achievable technologies. Since 2011 he had headed up Kinneir Dufort’s innovation team leading global innovation projects for the likes of Sony, Coca-cola and Unilever through to new start-ups. His team help clients identify new market opportunities, plan next generation products and create long term innovation pipelines. A key area of focus over the last 5 years has been on wearables and technology enabled products. Peter’s innovation and design consulting background has included working for !What if? Innovation, the Design Council and Dyson and spans multiple sectors across FMCG, Consumer Product and Medical industries. Peter is passionate about applying the right processes using collaborative creativity to help navigate the complexities of big innovation challenges and focus on finding the big ideas that can be realised to deliver differentiation and growth. Peter holds a Masters from the Royal College of Art in Industrial Design Engineering. Previous articleWearing healthcare devices – evolution or revolution?